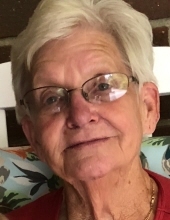 Mrs. Frances C. Henderson, age 76, of Rockmart, GA passed away Wednesday, February 6, 2019. She was born in Cedartown, GA on February 12, 1942 a daughter of the late Robert Milam, Sr. and the late Annie Fortune Milam. Mrs. Henderson had lived all of her life in Polk County where she was a member of the Bethlehem Baptist Church. She was a former employee of the Goodyear Mill having worked in both the Cedartown and Rockmart Plants. Mrs. Henderson had also worked for the Rockmart Nursing Home as a CNA. In addition to her parents she was preceded in death by her husband, Bill Henderson; sons: Anthony Dewayne Henderson and Bobby Henderson; daughter, Wanda Elaine Henderson; grandson, Matthew Henderson; by two sisters: Patricia Chastain and Ruth Shepherd; and by two brothers: Bobby Milam and Robert Milam, Jr. Survivors include a daughter, Nancy (Chuck) Joiner, Summerville, SC; sons: Tim (Freda) Henderson, Rockmart, Barry (Chrisy) Henderson, Cedartown, Earl Joe (Ponda) Henderson, Rockmart, Greg (Tina) Henderson, Piedmont, AL and Danny (Claudia) Henderson, Rockmart; two sisters: Cheryl Weaver, Cedartown and Brenda Wills, Jacksonville, AL; nine grandchildren: ten great grandchildren; special friends: Leon Roberson, Rockmart and Amanda Ford, Rockmart. Funeral services will be held Saturday, February 9, 2019 at 11:00 am in the chapel of the Alvis Miller & Son Funeral Home with Rev. Jeff Hulsey, Rev. Joey Davidson and Rev. James Rogers officiating. Interment will follow in Polk Memory Gardens. Pallbearers will include: Danny Henderson, Scott Henderson, Joey Watts, Lee Couch, Alec Ledbetter and Rodney Hutcheson. The family will receive friends Friday evening from 6 until 8 pm at the Alvis Miller & Son Funeral Home and at other hours may be contacted at the residence of Joe & Ponda Henderson, 525 Callaway Terrace, Rockmart. The Alvis Miller & Son Funeral Home is in charge of arrangements for Mrs. Frances C. Henderson. To send flowers or a remembrance gift to the family of Frances C. Henderson, please visit our Tribute Store. "Email Address" would like to share the life celebration of Frances C. Henderson. Click on the "link" to go to share a favorite memory or leave a condolence message for the family.